Vertical Stripe Scarf using the technic 'Intarsia'. There are two ways to make striped-color knitted fabric. One is a simpler way which changes the yarns at the beginning of the row. And other on is the way to be described here, 'Intarsia'. The concept of 'Intarsia' is knitting every color yarn on a row. The point of 'Intarsia' is making the interlock between the neighbor colors while you are knitting a row. If you failed to make the interlocks, the fabric would be separated. This technic is as same as that of big 'Argyle' patten. This project will be a good practice for more complicated patterns which have large different color blocks. Because of the numbers of the stripe is less than those of 'horizontal' stripe, Intarsia based stripe scarf has a simpler taste. These are our most favorite patterns in scarves. We choose the Debbi Bliss's Merino DK. This yarn is very soft in touch. 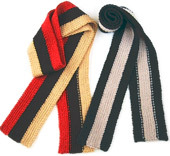 This property is nice for scarves which touch widely around your neck. As shown above chart, this fabric is basically k1-p1 ribbing. Cast on stitches as same as The First Scarf using Double Cast-On method or another casting on method. Cast on all of the colors on a needle. Turn the fabric, and work the first color yarn all, then insert the right needle int the first stitch of the next color, move left the first working yarn(See red arrow) , pick up the next yarn under the first yarn(Blue Arrow), purl. Same as the second row, work the first color yarn all, then insert the right needle into the first stitch of the next color, move left the first working yarn(See red arrow), pick up the next yarn under the first yarn(Blue Arrow), knit. Continue until the length you prefer. These products in photo are 150cm. Cast off using each color.